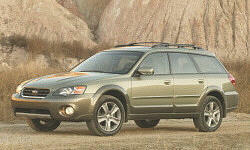 Why the 2007 Subaru Outback? Quite versatile vehicle for my outdoor pursuits. Easy to mount and carry bikes, skis, all of that. All wheel drive and ground clearance are nice to have for bad weather or trying to get to a remote location. You wouldn't confuse it for a sports car, but it gets up and down the canyon very nicely, too. I think the wagon looks pretty sharp. I prefer this body style to the newer ('10), which looks more like an SUV or a bloated wagon. 17 inch wheels look good on this wagon. Also really like the interior styling and dash board layout. Nice place to spend time. Why Not the 2007 Subaru Outback? I was amazed at how small the back seat is in this car. Really no bigger than a compact sedan, eg Civic or Corolla. I can't fit my 3 kids (in car seats) back there, and feel bad when co-workers pile in to go to lunch. Surprisingly small for a vehicle this size, and marketed as a "family car." If you plan to put adults or 3 kids back there regularly, look at the '10 or newer (or at something else -- the rear seat in my co-worker's Accord is far bigger and more comfortable). All wheel drive is nice on certain occasions, but I've been disappointed in the fuel economy of this car. I do have some reliability concerns, as this engine is notorious for head gasket problems. I noticed that my coolant tank was empty a couple weeks ago. I'm going to track it closely now, but I will be very disappointed if I have to do major work on this engine (head gaskets). I don't understand how you can complain about fuel ecomomy. Mine roughly meets the values Subaru claimed. It's a 3,500 lb car - so of course it costs something to drive in the city. I get ~ 19 -20 city and 26-28 on the highway. North Florida has gentle hills: if you live in the mountains it will cost more to pull that body around. One note: the factory speedometer/odomometer over registers. I put 265 (instead of stock 255) tires on it and now the speed/odometer are accurate compared to my GPS. The mileage I listed is with the new Michelin tires. I got 30 MPG on the higheay with stock tires. I love the all wheel drive performance. I'm just afraid of the 100K head gasket failure. The MPG on this car is a BOLD FACED LIE. I have never, ever gotten anything moe than 24 mpg. Recommendation: Replace the Subaru radiator cap every 4 years. My 2007 Outback, after 7-8 years, coolant level was going down after each ~500km trip and making smells. I fully changed coolant but still no better. Then noticed tiny wear marks on the radiator cap. I replaced the cap. Problem fixed. Been great for another 4 years.